Michael McFadyen's Scuba Diving - Voodoo This is a site that (really) no-one dives. As far as I know, the only people who currently dive this location are members of the St George Scuba Club, although a few years back I did see a dive charter boat here, presumably after reading this page. As some residents of the Sutherland Shire may probably know, one of the better surfing sites in the Cronulla area is called Voodoo. This is located east of Boat Harbour at Kurnell, right next to the Cronulla Sewage Treatment Works outlet (until the early 2000s, this deposited virtually untreated wastes right off the rock platform). Until that time, you could only surf this location in westerly or southerly winds/seas and definitely not in north-easterly and easterly winds. The sewage is now treated to tertiary level so it is now no problem to dive here at all times (subject to seas). Note, this is NOT the shore dive that in recent years some divers have been diving. In the location of the surfing site, the reef runs out south for quite a long way, exactly 1.1 kilometres. The reef is generally flat and uninspiring, until that is, it reaches the sand. Here the reef drops from about 20 metres to over 28 metres. Since 1988 I have been diving this location and in honour of the nearby surfing location, we call the site Voodoo. Voodoo can be found by heading to 34º 03' 05"S 151º 11' 57"E (note all my readings use Datum AUS66 - see my GPS page for more info). If you cannot find the reef by using the GPS Reading and your depth sounder, line up the sewage outfall breather pipes with the Cape Baily Lighthouse (same mark as Osborne Shoals) and run in towards it till the reef comes up. Centrepoint Tower will also line up with a track over the sand dune near Boat Harbour. Drop anchor. 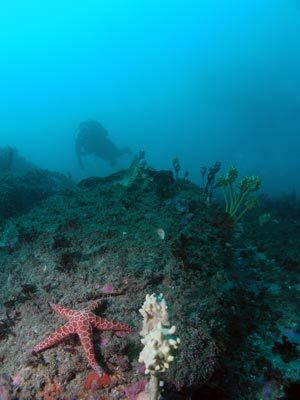 The dive site here is composed of a flat reef top with some small cracks, a small wall of a metre or so and then a quickly slopping reef to the sand at 28 metres. There are a lot of very large boulders on the reef edge and on the sand. The reef here runs basically east/west but further west turns to the south. To the east it eventually turns north but I have never dived there. 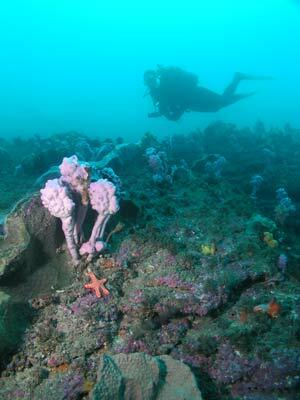 The sponge life is excellent with very nice sea whips, gorgonias and sea squirts/tulips. The gorgonias here are probably the most abundant of any site in Sydney, with all different colours seen. The fishlife is also usually very good, generally a lot of silver sweep, one-spot pullers and yellowtail. You will also see many black reef leatherjackets and some six-spined leatherjackets all along the reef. You may also see eastern blue devilfish under some of the overhangs and on the sand, angelsharks, serpent eels, and Port Jackson sharks (in winter). We have also seen a big belly seahorse on a sea tulip and small firefish/lionfish. Visibility is normally very good, with in excess of 20 metres on all recent dives. There can sometimes be a slight to moderate current on the bottom, normally running to the west, but it is never a real problem. All in all, an excellent dive for the more experienced diver.